Lady of the English is Elizabeth Chadwick's most recent novel. 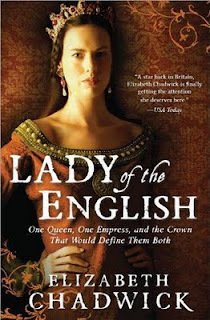 Set in the first half of the 12th century, it revolves around two royal women: Empress Matilda and Queen Adeliza. Matilda is called back to England after her husband, the German emperor, passes away without heirs. She returns to meet her father, Henry I, for the first time in many years and is introduced to her step-mother, Adeliza, who is just about the same age as Matlida herself. The two become fast friends, even though they are so different. Matilda is rigid and firm and does not suffer fools, whereas Adeliza is kind and ethereal and devoted to her charity works. Henry makes Matilda his heir, set to be Queen of England, but then sends her off to marriage in Anjou with a man half her age whom she strongly dislikes. And he continues to make no promises or stand true to his word, playing factions against one another to consolidate his power. It works well for him, but when he passes away, he leaves England with no strong contender for the crown and it is taken by Stephen, his nephew who had previously promised fealty to Matilda. This sets off a long, bitter war between Stephen and Matilda, with all of England to suffer between them. This is a period that has been written about many times before (see my review of When Christ and His Saints Slept), and it was with some trepidation that I approached this book because, having just finished Lionheart, I didn't really want to plunge myself into the sea of Medieval warfare again. But I need not have worried. Chadwick does not focus on battles and military strategy. Instead, she focuses on her characters and this book was full of nuanced characters, all of whom had very rich and complex relationships with each other. Chadwick sheds a new angle on this old story by focusing on Adeliza, and not on Stephen's wife (also Matilda) as the foil to Matilda. I really enjoyed this take because Adeliza saw both sides of the war and had to walk a very fine line between the two camps, whereas if we had gotten Stephen's wife's point of view, the book would have been much more "he said, she said" in scope. I really liked Adeliza. She was a kind and generous woman, but she also saw things very clearly (except perhaps for her very rose-tinted glasses view of her first husband, Henry I) and had a strong sense of moral values. Matilda was a little harder for me to warm to, but I think she was hard for everyone to warm to. She was hard and cold and often very sharp in her dealings with other people. It surprised me, in many ways, that she was able to keep people so utterly faithful to her cause, while Stephen could not. And I think that's where this book really shines. The way the characters interact with each other is just fascinating and their relationships are so complex. Matilda and her second husband Geoffrey have a very disturbing relationship with each other, so odd that I can see why their son Henry II grows up to be so lacking as a father. Chadwick underpins their every scene together with tension and sparks, and as a reader, you can just imagine how awkward it must have been for any bystanders of their conversations! The relationship between Adeliza and her second husband, Will, is very different. The two care for and respect each other, but it was very clear that one spouse had much more sway and influence over the other. Brian FitzCount's relationship with Matilda, though, was the one that most intrigued me. FitzCount met Matilda upon her return to England and received a tongue-lashing from her very quickly for the way he handled her arrival. And from that time forward, he was utterly and completely loyal to her. There was a bond between the two of them, and he never gave her reason to doubt him. But she was so often waspish towards him, and his devotion to her caused him a great deal of grief and internal turmoil. There must have been something in Matilda that brought such steadfast men to her banner, there to stay loyally until their deaths. Perhaps it was the sense of honor and full understanding of her royal duties that made them believe in her. The book also offers us tantalizing glimpses into the enigma, the firecracker that will become Henry II. If those scenes are any indication of what's to come in Chadwick's Eleanor of Aquitaine trilogy, I cannot wait to see what happens next! I have to agree with you that Lionheart was rather battle-heavy, and at times I lost my concentration. It sounds like this book focused more on personal aspects of the characters, which is something that I think I would enjoy. I have not yet read any books about these particular players, and your review makes me anxious to grab this one. I also have not read anything by Chadwick yet, so I could totally kill two birds with one stone! Very elegant and wonderful review today, Aarti. I enjoyed reading it and am adding this to my list right away. I have just read this novel as well and am writing about it in a chp of my PhD thesis on Romance and Realism in the historical novel. Great review! I really enjoyed this one as well and as in most of Chadwick's books, one of her strengths is the relationships between her characters and striking the right balace between those relationships and the battles (which were a fact of life). This one does sound good, Aarti - thanks for your review! Zibilee - Yes, definitely focused more on the people than on the battles or politics. I preferred that, but I can see why some people would want more of the other stuff. Carol - Ooh, what a great PhD thesis! I hope you're having fun researching it. Daphne - Yes, I prefer the emphasis to NOT be on battles and I think her propensity to have female POVs takes us away from those scenes a bit, which I appreciate. Tracy - Glad you enjoyed it! I have owned this since the summer and still not found time to actually read it... I am glad you enjoyed it and I look forward to reading it myself! I've never read any of Chadwick's work, but I've been jonesing for some historical fiction lately, so this might be the way to go!